Happy Valentine's Month, everyone! Being a floral studio, we obviously love February and all the amazing people we get to work with and create flowers for. 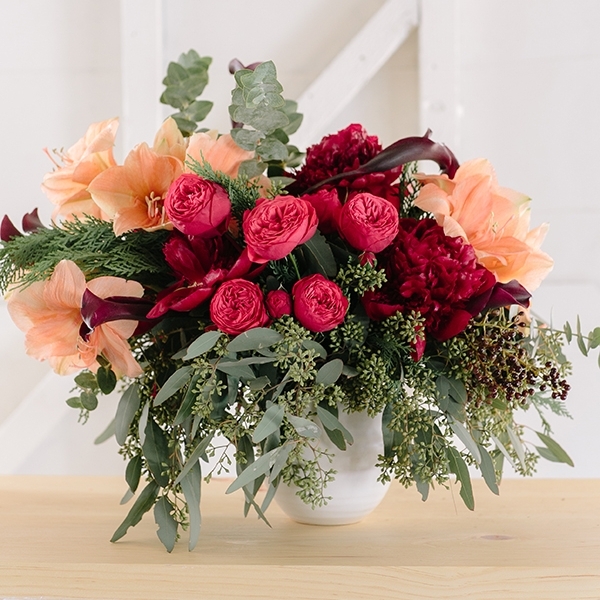 For this month's blog, we want to give you a little history on why we send flowers, as well as show you some of our favorite ways to gift your loved ones a unique and memorable floral arrangement. Originating in third century Rome, legends declare that the history of Valentine’s Day began with a young priest who refused to deny young lovers their right to marriage. During this time, marriage was outlawed for young men as it was decided that they were best suited as soldiers. However, that young priest -- Valentine, was still performing marriages in secret. Upon being discovered for his now illegal act, Valentine was imprisoned and sentenced to death. While in jail, Valentine found himself falling in love with his jailor's daughter. Upon facing his death sentence, he sent her one last love letter, and signed it, "From your Valentine." He was executed on February 14, 270AD. Nearly two hundred years later, February 14th was dedicated to "Saint Valentine," and today, we celebrate his noble actions for love every year by sending cards, flowers, sweets and love. At White Fig Designs, we are excited to create flowers for you and your loved ones that are not your average grocery-store dozen red roses. 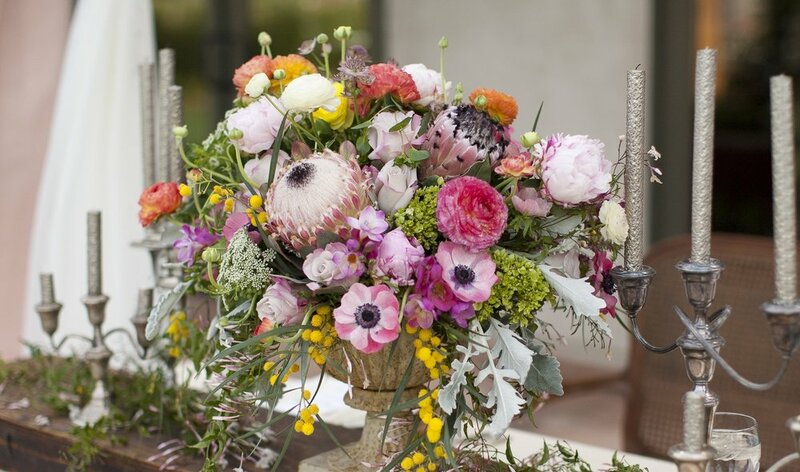 We love to piece together various elements and color palettes to create arrangements and bouquets that are interesting, beautiful, and eye-catching. This Valentine's Day, you can show your loved ones just how much you love them by sending them unique flowers curated to their individual style. We're taking orders for Valentine's week now, so don't hesitate to contact us and place your order! Below are some ideas of arrangements we'd be thrilled to create for you. 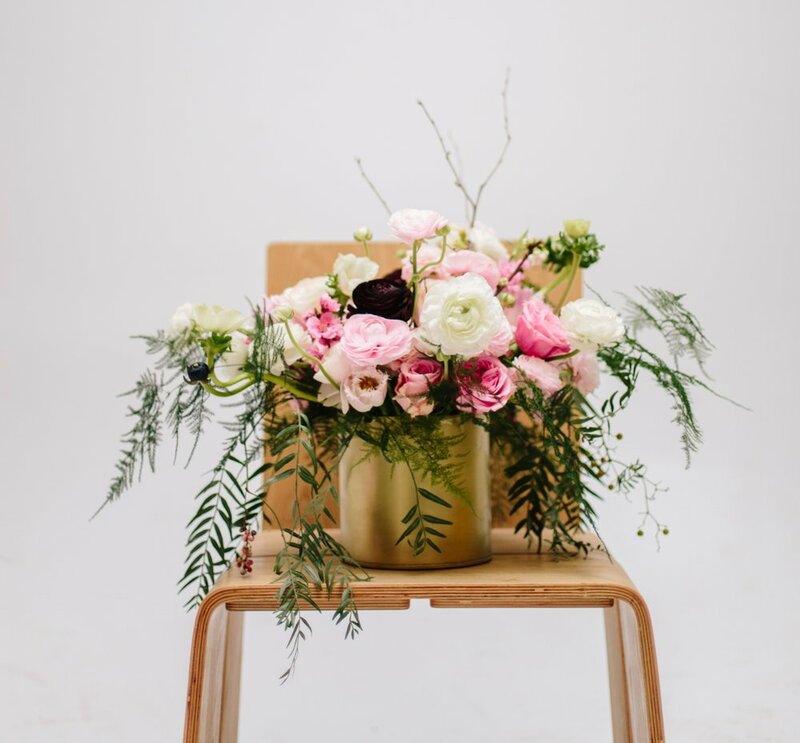 Dedicated to bringing original and authentic flowers into our clients' lives, White Fig Designs is a small floral studio run by an enthusiastic tribe. Gratitude is always on my mind, but especially at this time of the year--without my family and my team's support, White Fig could not be what it is today. It is with a heartfelt thank you that we acknowledge the gift of being invited into so many families and their most exciting events--from weddings to babies and every party in between, we are so thankful to be able to celebrate life's monumental moments with our clients and bring the element of natural beauty to every celebration. Pictured above: A cozy Thanksgiving dinner featuring White Fig's florals, styled and blogged by our dear friend, Eden, of Sugar And Charm. As we are expressing our thankfulness, we can't help but take a moment to say how grateful we are for a creative friend who shares our love for naturally enhancing every setting, staying authentic in our work, and celebrating everything! 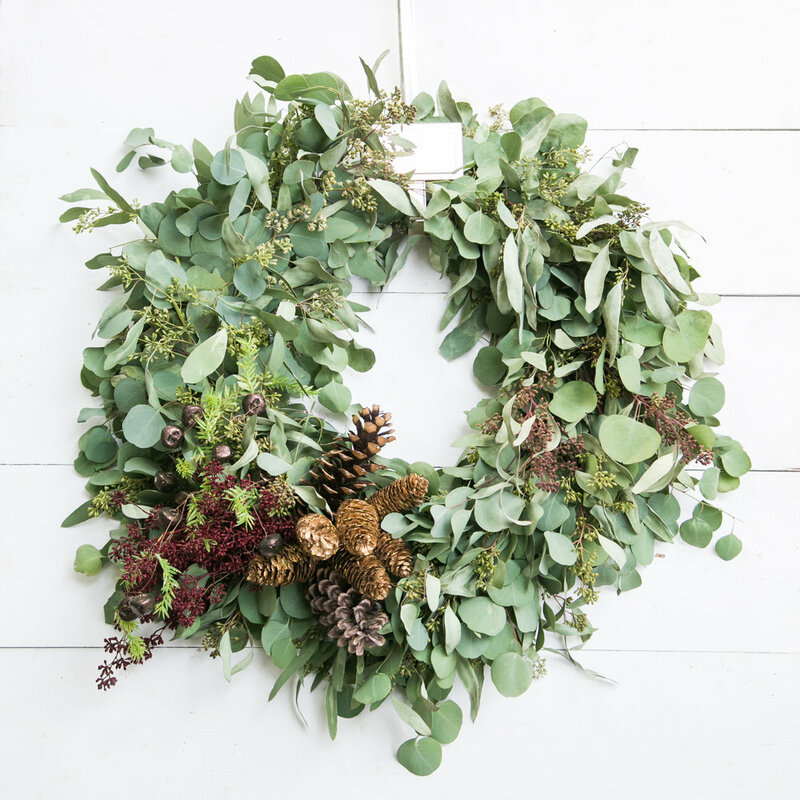 Pictured above: custom wreaths created for our holiday wreath workshop that we host each holiday season with our friends at The Daily Harvest. We are truly so thankful to be a part of the local small business community with people as wonderful as their team! 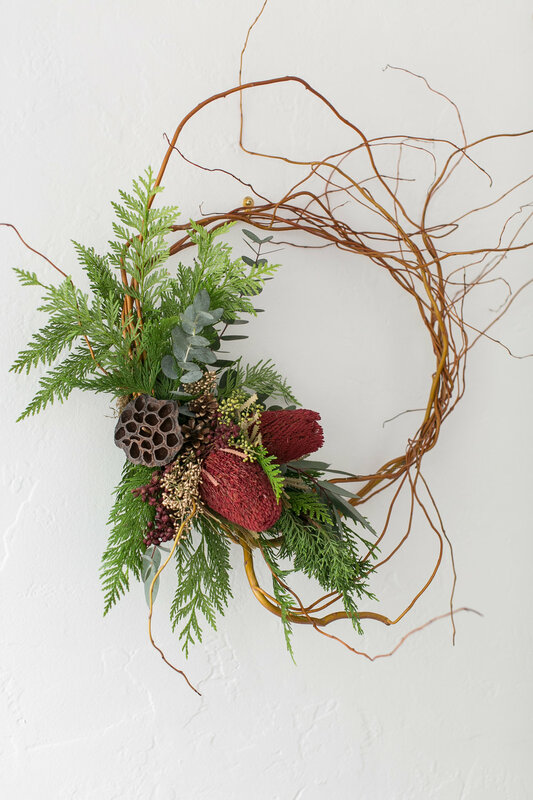 **Keep up with our Instagram this weekend to see some Behind-the-Scenes action at this year's wreath making workshop! This summer I had the divine privilege of attending a floral workshop in Skagit Valley, Washington at the Floret Flower Farm. This experience was truly a dream, an experience that I cannot adequately put into words, and I'm delighted to bring what I learned home to White Fig. Part of the flower business for me is taking time each year to attend a workshop to better my craft, gain new knowledge, and refresh my love and passion for floral design. This year's experience has accomplished and far exceeded each of those hopes. 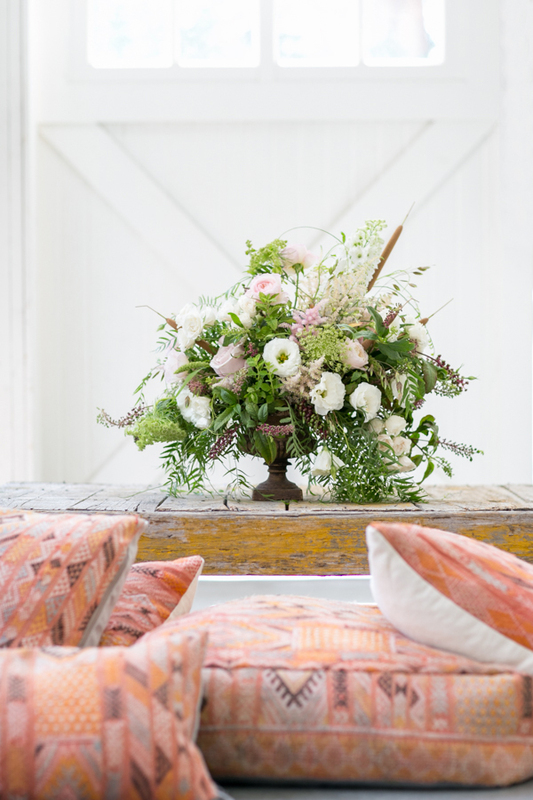 Flower Farmers and Designers came from all over the world--places such as Australia, Canada, Colorado and New York--to attend and to instruct this workshop. The farming portion of the workshop took place on the Floret Flower Farm, run by Erin Benzakein, where we toured the farm property and learned about the ins and outs of flower farming. The design portion of the workshop took place inside of a neighboring Barn, designed and set for us in the most organically beautiful way. Erin's openness and willingness to share her life and knowledge with the twenty-five of us was both informational and inspiring. This was an intensive three-day workshop in which we learned, collaborated, and expanded our knowledge of and creativity with flowers. When we first walked into the barn, I was absolutely overwhelmed with emotion. The contrast of the dark barn and the sunlight cascading in through its windows and cracks set the tone for us all to marvel at the beauty of nature in its purest form. The focal point of the barn was, of course, the buckets upon buckets of gorgeous flowers just saturating the room. Roses, peonies, poppies, irises, anemones, delphiniums, and honeysuckle were among the flowers creating this atmosphere of appreciation and wonder. As shown above, we were all seated in a circle where Erin welcomed us all and taught us a bit about her farm. She then asked each of us to introduce ourselves, and when it came to me, I was immediately overcome with emotion. Embarrassed by my unexpected tears but authentic in my emotion, I began explaining to them how much of a treat this experience had already been for me. I told them that before this workshop, I was talking to my twenty-eight year old daughter who had just returned from a work-sponsored "Inspiration Vacation" in India, and as she told me about her trip, I found myself feeling bitter that she got to do something like that at such a young age. It was the moment I walked into this barn that I realized what this trip was for me--pure inspiration, and a beautiful vacation. It was my dream-come-true, Inspiration Vacation. For me, White Fig Designs is so much more than a flower shop. It is about relationship, it is about expressiveness, and it is about organic authenticity. 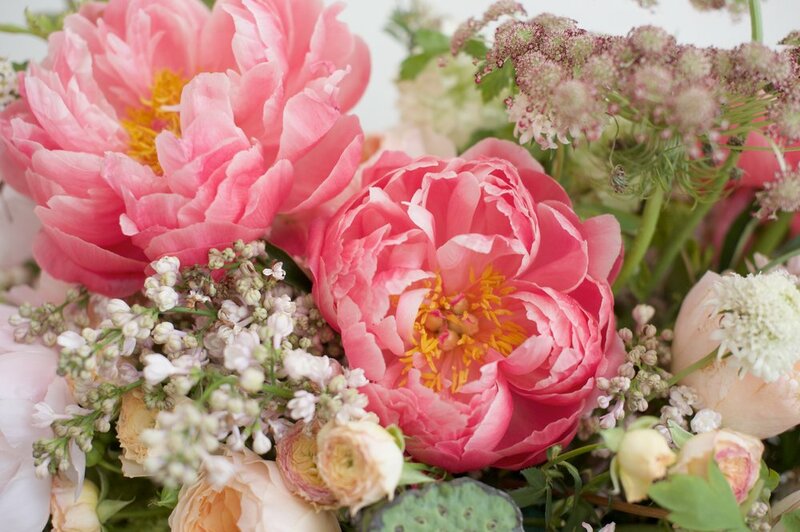 That is why taking time each year to get away and learn is a priority, taking workshops from designers like Francoise Weeks and Brooklyn's Little Flower School. White Fig is dedicated to staying educated, creative and current to produce beautiful and elegant arrangements to the best of our ability. As Erin told her business story throughout the workshop, I felt a deep connection to her journey. She spoke of her years of searching for her "niche," knowing that she had always had a burning desire to do something "big." As she told us about her days trying to start a candle business and various other creative avenues, I reminisced on my feelings as a mother of two knowing that I had a deep need and desire to birth something new, something big. That is why I opened White Fig. From the first night, I knew that I was surrounded by kindred spirits. We hear girls talk about their "tribe," and I knew in this short time that these women truly are just that--my tribe. We all share the same passion for the same thing. This process has given me a new found commitment to trying to buy local whenever I can, rather than buying imported flowers, and therefore leaving a smaller footprint on the world that we live in. This workshop taught me to do my best to support local farmers and help enhance their business. Both indoors and out, this trip was absolutely heavenly. I still feel overwhelmed with emotion as I look back on these three perfect days. An exciting experience in the workshop came when we were all given a variety of flowers, and the same vessel to create an arrangement in. As exciting as it was, there was also an element of challenge as I knew that there were dozens of talented, successful floral designers there doing the same thing I was. What I quickly learned was that it was not actually challenging at all--because everyone was so incredibly supportive and encouraging with one another. The abundance of flowers that we had to choose from was incredible. Creating various projects together also taught me a lot about building a team that is compatible with one another, everyone bringing traits that complement one another rather than compete. Below are some arrangements we created! The last night concluded with a beautifully set, professionally cooked meal for all of the attendees. That day was spent creating garden arrangements for the tables and styling this beautiful archway (below) leading to our seats. I cannot say enough how incredible this experience was for me, how refreshing it was for my creativity, or how motivating it was for my business. After experiencing this workshop, I truly believe that everyone deserves to have and should go on an Inspiration Vacation to take time to reignite your passions and refuel yourselves to come home and accomplish your dreams. All photos by Chris Benzakein. Hello my lovelies! We are so excited to officially announce a NEW way of ordering flowers for your wedding--The White Fig Designs A La Carte Menu. After years of working in floral design in the event industry and watching how styles of weddings have evolved, we have discovered that not every bride needs a full service florist on their wedding day. 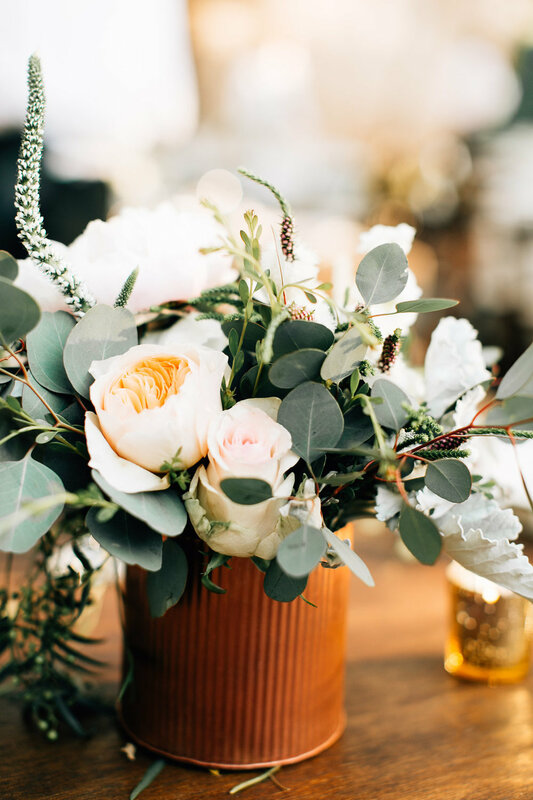 Realizing that for some couples, the intimacy that accompanies having personal flowers is more than enough, we have curated a menu suitable for any bride on any budget--without compromising the way your florals can showcase your personality. Crafting together and implementing this menu with future brides allows us as designers to expand our creativity and give you as a couple exactly what you need on your big day. The A La Carte menu, in comparison to utilizing White Fig as a full service florist, keeps convenience and budget in mind, as we allow you to pick and choose what you need based on sizing & pricing. You can choose your style and color palette, and leave the creativity up to us! Using photos from our past weddings, we have compiled various mood boards on our Pinterest page to help you get a feel for the styles we offer, finding which ones suit you best. For our traditional brides, we are still joyfully booking full-service weddings for the remainder of 2017 and now 2018! 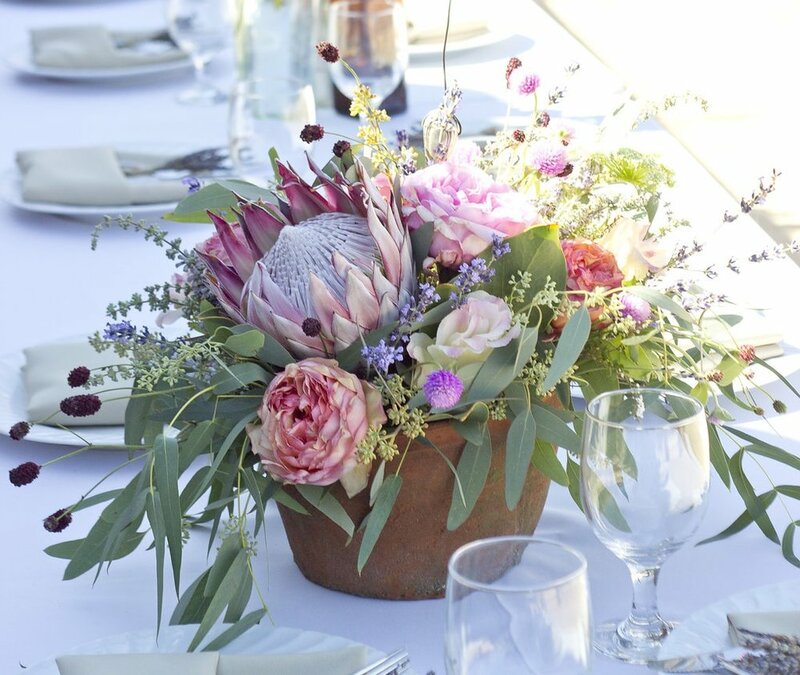 With a full-service package, the White Fig team will hold your hand through the intimate design process, accompanying you on your venue walk-through and working closely with you to tell your story through flowers. With this option, every element is entirely customizable and creativity is abounding. Below you will find florals from the weddings of the brides who inspired us to create this menu, as well as various examples of the individual items we can create for you. 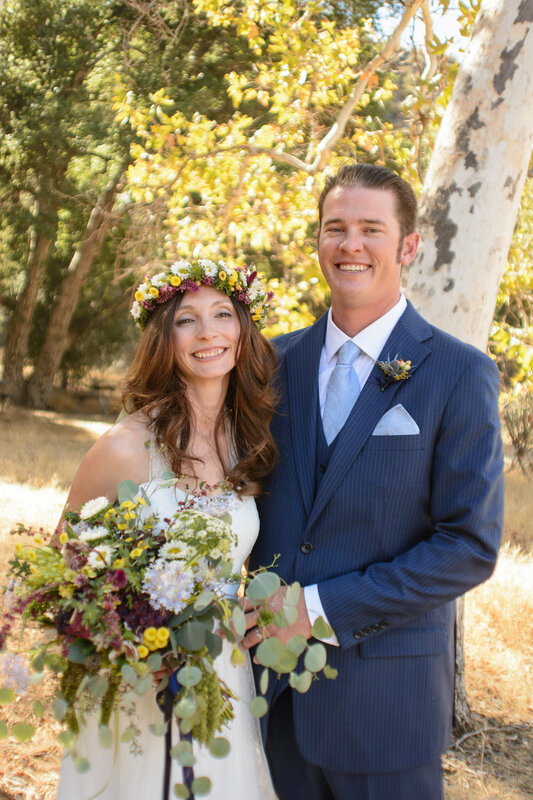 Our most recent A La Carte style bride was Alexa, who came to us seeking a romantic yet wild style of bouquet & hair piece for when she said "I do" to her fiance, Luke. With various sizes, styles, vessels and elements, you can craft together the perfect assortment of flowers to fit your desires for your day. We are excited to offer arrangements of varying sizes, to accentuate everywhere from the guest book table to the bar top! Whether it's a boutonniere for your officiant or a crown for your flower girl, we are thrilled to add the White Fig touch to one of life's most exciting events. An exciting option that accompanies the A La Carte menu is the versatility of working within your budget, and allowing others who want to help make your wedding dreams come true actually play a significant part! Many brides have family members who want to help in a special way, but often times they have trouble coming up with a sweet gesture that is more personal than just giving the couple a monetary gift for a certain purchase. 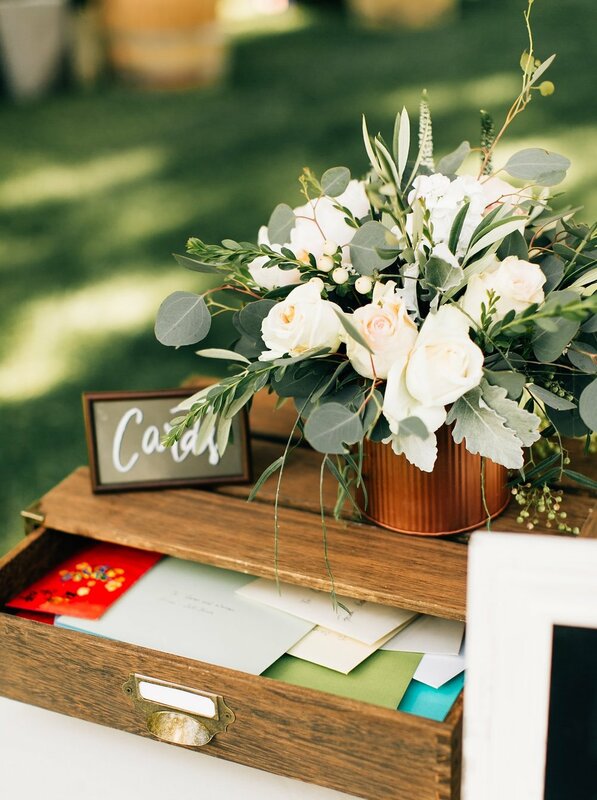 This style of menu can be sent out to anyone you want, and they can sign up to buy you just one or two floral pieces for your day. 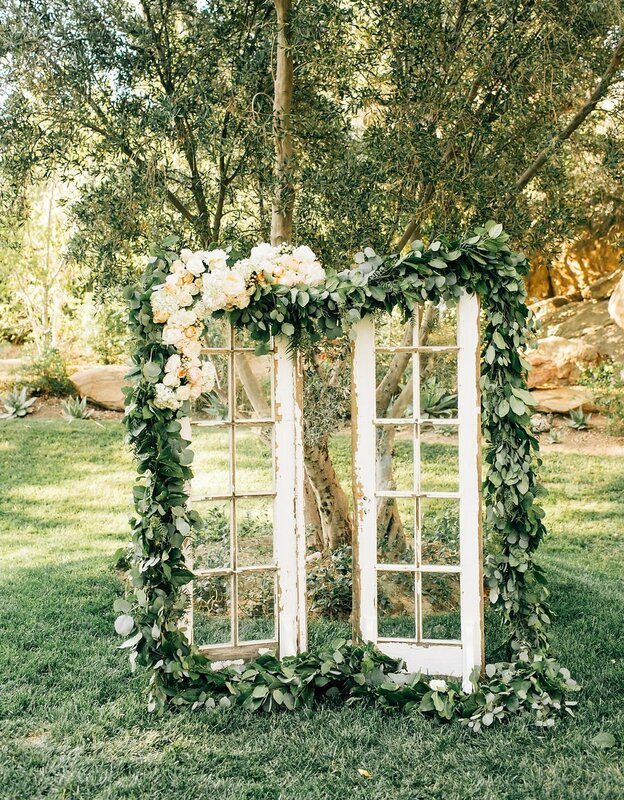 For example, they could choose to pay for your head table arrangement, a floral head piece for you, or perhaps a few feet of garland to accompany your welcome sign. The A La Carte menu is truly an opportunity to involve your loved ones in the planning process and include them in those significant and beautiful touches. When I first met Eric and Lindsey, they were living in New York–Lindsey working as a teacher and Eric completing Medical School. Lindsey grew up in Southern California, so it was perfect that they chose the Santa Barbara Historical Museum as their wedding venue. 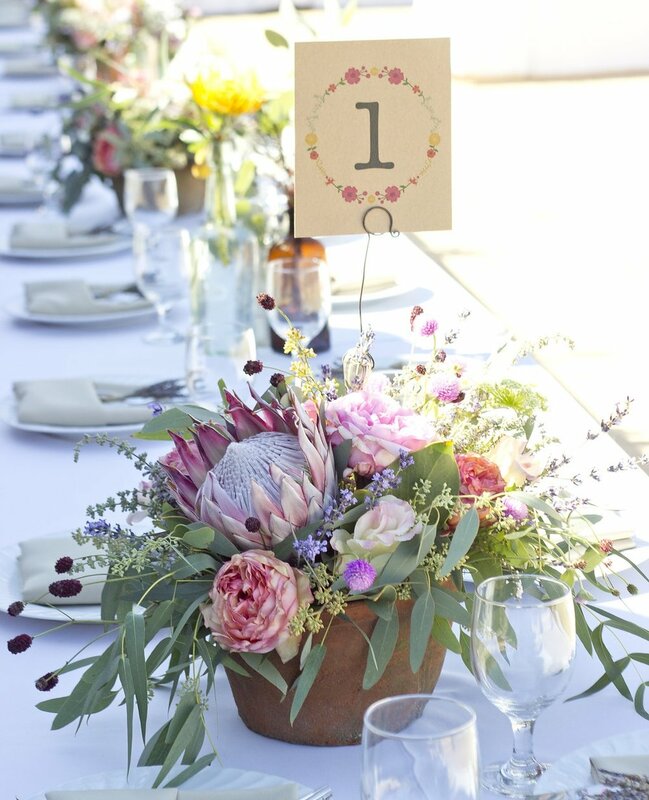 At White Fig, we love working with out of state couples, helping them bring the beauty of their special day to life. Whether it's quick meetings when they're in town, FaceTime calls, or just sending Pins back and forth--what matters to us is the intimate connection that we make with our couples, and distance does not change the process of creating their magical day. The Santa Barbara Historical Museum is the perfect venue to create an intimate and romantic wedding celebration. Eric and Lindsey's vision for their wedding was elegant yet natural, so this venue could not have been a better choice for them. 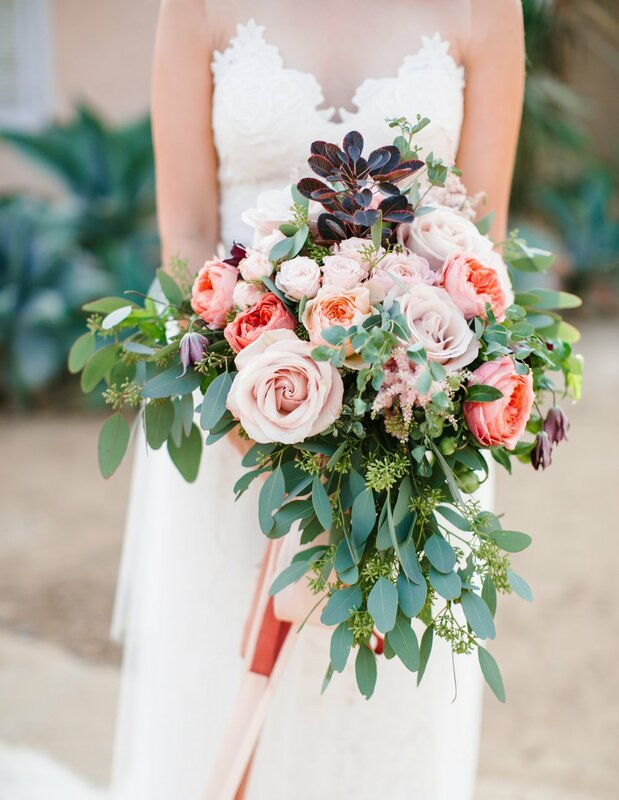 Creating Lindsey's vision was achieved by using garden roses, eucalyptus and scabiosa, and then adding astilbe to give the bouquets a more airy feel. We love the concept of making the girl's flowers all different but telling the same story, so that they look organic and natural, giving them a slightly different feel and not making them uniformed. The ribbon we used for the bouquets is from Silk & Willow, made of all organic material and plant dyed, creating an elegant feel that tied the natural beauty of each bouquet together. it's always a special touch to cut a flower from the bride's bouquet to create the groom's boutonniere. It warms our hearts to see all of the emotion of the day come alive after so many hours spent with Lindsey preparing for it. This arch was an important piece for Lindsey as it was used in the ceremony space and then repurposed to the king's table. The most precious moments are captured by the innocent. Special memories are caught of the moments when nobody's looking (except for this wonderful photographer -- Josh Elliot!). The little details are always important. They're the perfect touch to soften a hard area such as a bar or water station and make it come alive. Home Grown Event Co. did such a great job of marrying Lindsey's vision with our florals to create an elegant, organic setting. CHEERS to this celebration of life and bringing two families together! How lovely it is for Lindsey and Eric to have the support and love of two wonderful families throughout their lifetime. White Fig considers it an honor to have been invited to share in this special time in their life. Sign up with your email address to be the first to receive our latest blog posts! All Photos by Josh Elliott Photography. As summer is coming to an end it's time to savor those final few warm weekends and enjoy BBQ's with friends and family. It’s also the time of year when you can enjoy some to the best produce your local farmer's market has to offer. Harvest time is in full swing. Our good friends at Pulchella Winery know all about that. Right now they are up in Paso Robles harvesting grapes for their next delicious batch of wine. Before they started all the hard work they had a great party, to celebrate their cult members and the end of the summer. I was lucky enough to help stage and do flowers for. It was a fun rustic backyard event - wine and a pizza oven, what more could you want? Oh yes, good company, and that was abounding. Grilled artichokes grilled figs and lemons and of course a glass of Pulchella wine. Cheers to a Fall Harvest!